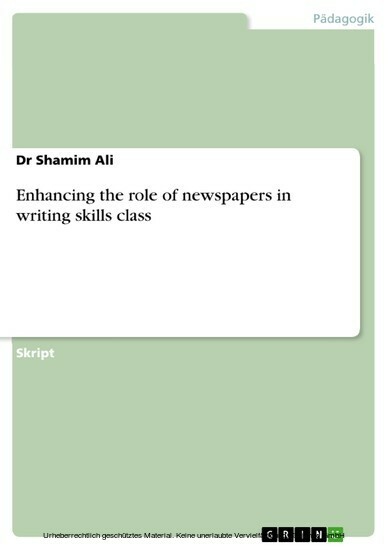 Skript aus dem Jahr 2011 im Fachbereich Englisch - Pädagogik, Didaktik, Sprachwissenschaft, National University of Modern Languages, Islamabad (-), Sprache: Deutsch, Abstract: This assignment will draw attention to some ways in which newspapers can be used in teaching writing skills.The newspaper can be incorporated into almost any teaching curriculum, and which is particularly useful for teaching English language. Newspaper is comfortable instructional valuable tool for language teachers ,and learners are more comfortable learning with a newspaper than with any other instructional materials. It can appeal to learners who are not easily motivated.